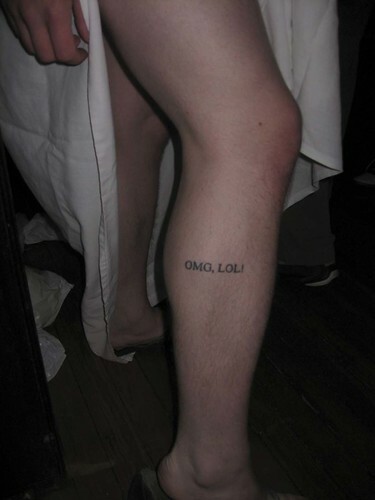 We all know what a tattoo is. They’ve been around for centuries and surely will continue to decorate the skin for centuries to come. Time only enhances them by adding vibrant colors and ink that shows up best under black light. While mothers have always cringed at the thought of their baby getting a tattoo, most of us know someone with a tattoo or two and some of us have our own. Recently, I had a couple more done, so I thought I would post them and some that other people have that are equally as geeky. Above is a photo showing all my ink. 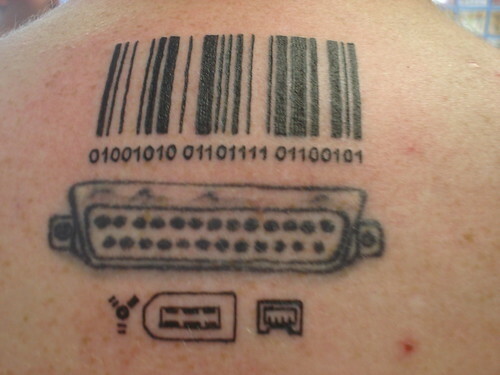 Almost 3 years ago, I got a parallel port tattooed on my back. That’s the port in the middle that is a little lighter than the rest. I have been in love with computers since the first time I was on one in the early 80’s and it’s something I am very passionate about. Years ago, I wanted to get a bar code, but by time I got around to it, everyone else had one, so I opted for a parallel port instead. It was my first and when it was done, I immediately started thinking about what else I wanted done. Life kept me busy and I eventually started thinking about it again and worked out what I would want next. Last weekend, I headed to Americana Tattoo and added to my collection. The bottom row is a FireWire logo, followed by two FireWire ports. At the top, I finally got my bar code. I figured I shouldn’t care what everyone else has and did it anyway. However, I did make it a little more original. I used an online bar code image generator to generate a Code 128 barcode. I chose this standard because it’s easy to scan. The bar code should actually scan as “Joe” and the numbers underneath it spell out “Joe” in binary. 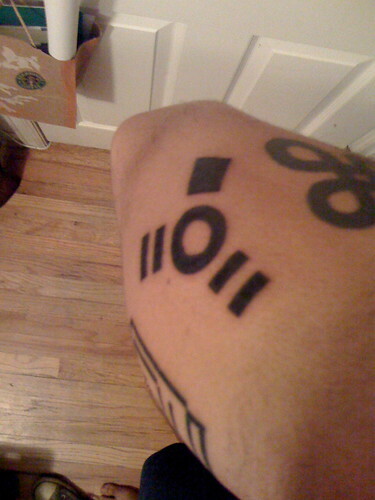 These tattoos are just a small part of a much bigger plan. There’s a ton of geeky tattoo photos out there on the net, but I just grabbed all these from the Geeky Tattoos pool on Flickr. 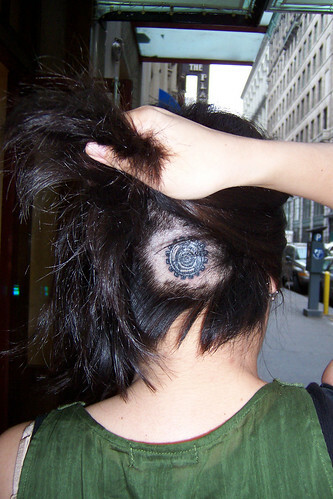 I had been planning a Matrix port tattoo to go with all my other ports, but I think it needs to be just a bit lower than the one below. I love the Tank Girl tat, because I’m a big Tank Girl fan. 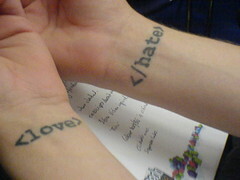 Of course, there’s the binary and the HTML-like tags (which are also on my list). Finally, there’s a bigger version of the FireWire logo, proving I’m not the only one crazy enough to ink that into my skin, and the “OMG LOL” tattoo, which has me thinking, well, “OMG! LOL!”. Now I have questions for you. 2. 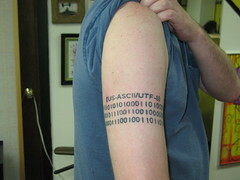 What’s the geekiest (or your favorite) tattoo you’ve seen? 3. Any plans for geeky tattoos? If you’re geeky like me, you already know how to geekily say “I Love You”, but what if you’re not and you want to say “I Love You” in a geeky way to your geeky loved one? Don’t worry. I’m here to help. Send your loved one an electronic greeting card via Blue Mountain or Hallmark. Show your smushy-face huney-buns you know what they like by getting them something from Think Geek. If they’re truly geeky, they’ll love it. I’m not a Trekkie, so don’t ask me, but I’m sure there’s a way to say “I Love You” in Klingon. Grab the code for your geek’s favorite programming language here and just replace “hello world” in the code with “I love my geek” or any other message. Don’t worry. These are usually only 1-3 lines of code, so you should have no problem. So how would YOU say “I Love You” in a geeky way?